In the words of Henry David Thoreau,"Cape Cod is the bared and bended arm of Massachusetts: the shoulder is at Buzzard's Bay; the elbow, or crazy-bone, at Cape Mallebarre; the wrist at Truro; and the sandy fist at Provincetown." 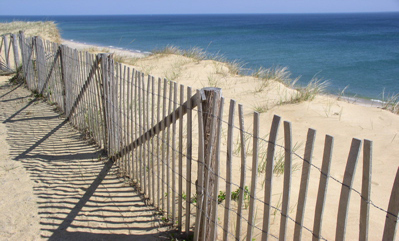 The Cape Cod National Seashore boasts some of the world's most beautiful white sand beaches. Buried deep in the New England sand is the story of the Mayflower and America's first settlement at Plymouth, dating back nearly 400 years. 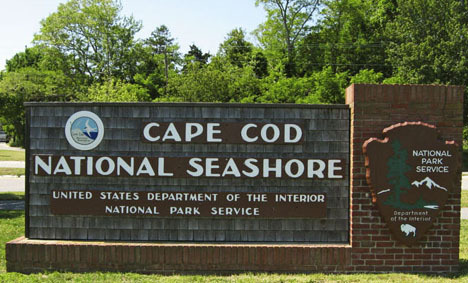 The Cape Cod National Seashore (CCNS) was officially created on August 7, 1961 by President John F. Kennedy. It was his labor of love and forever tied him to this beautiful area. It encompasses 43,500 acres of ponds, woods and beachfront. 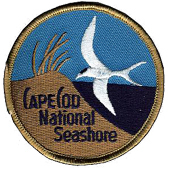 The CCNS includes nearly 40 miles (60 km) of shoreline along the eastern edge of Cape Cod, facing the mighty Atlantic. The towns of Provincetown, Truro, Wellfleet, Eastham, Orleans and Chatham all have part of their land in the CCNS. The CCNS is run by the National Park Service, with the dual goal of protecting precious, ecologically fragile land, while allowing vacationers and residents to enjoy a truly unique resource. Of special note is Marconi Station -- site of the first two-way transatlantic radio transmission -- which is situated in the Cape Cod National Seashore in Wellfleet. On highway 6 in Eastham, the large CCNS sign welcomes travel weary vacationers like a beacon. After a long day's drive to the Cape, I know I'm officially here once I see that sign. This is where the turn off is to the newly re-built Salt Pond Visitors Center. (Its the large hexagon shaped building on the right). The Visitor Center is a great place to learn more about the National Seashore and the government's efforts to protect it. Spend some time with the excellent educational exhibits and continuous film loops offered here. You can view a short movie of how the Cape was formed or take in an exhibit on marine life. Special events like nature walks, movies hikes and lectures are offered daily through October. Particularly intriguing is a video about the 1990 discovery of an 11,000-year-old campsite amongst the storm-ravaged dunes of Coast Guard Beach, which was about 5 miles inland when these early settlers spent their summers here. After soaking in some of the local history, be sure to take time to venture out -- on your own or with a ranger guide -- to the surrounding trails.These trails are great for bird watching so bring your binoculars and camera. For more information about the Cape Cod National Seashore, you can head up to Race Point in Provincetown, where another visitor center is tucked into the dunes. Really cool! Open:The Salt Pond Visitor Center is generally open daily year-round from 9 AM to 4:30 PM. The summer has extended hours to 5 PM.